Cristina Ramos Almeida, researcher at the IAC, and Claudio Ricci, from the Institute of Astronomy of the Universidad Católica de Chile, have published a review in Nature Astronomy on the material that obscures active galactic nuclei obtained from infrared and X-ray observations. Black holes appear to play a fundamental role in how galaxies evolve during a phase in which they are active and consuming material from the galaxy itself. During this phase, the galaxy hosts an active galactic nucleus (AGN), and the effect that this nuclear activity produces in the galaxy is known as AGN feedback. For instance, the AGN can heat, disrupt, consume and remove the gas available to form new stars, preventing further galaxy growth. AGN feedback is now required by simulations of galaxy formation to explain the observations of massive galaxies at cosmological distances. "If AGN feedback is not accounted for in the simulations," explains Cristina Ramos, "the predicted number of massive galaxies when the universe was younger is much higher than those that are observed." Directly studying the influence of nuclear activity on galaxy evolution is challenging because of the different spatial scales and timescales involved in the two processes. Massive galaxies host extremely compact supermassive black holes of millions or even billions of solar masses in their nuclei. It is estimated that the phases of nuclear activity last for a short period of time, between 1 and 100 million years, whereas galaxy evolution processes, such as bulge growth or bar formation, last much longer. "In order to study the connection between the AGN and the host galaxy, we need to look at the nucleus of galaxies, where the material that links them is found. This material consists mainly of gas and dust, which are normally studied in the infrared and X-ray band," explains Claudio Ricci. The astrophysicists offer a comprehensive view of the current understanding derived from infrared and X-ray studies. These have greatly improved in the last decade thanks to observing facilities such as CanariCam on the Gran Telescopio CANARIAS (GTC), located at the Roque de los Muchachos Observatory (Garafía, La Palma) and the Very Large Array Interferometer (VLTI) in the infrared range, as well as X-ray satellites like NuSTAR, Swift/BAT and Suzaku. Cristina Ramos says, "We now know that this nuclear material is more complex and dynamic than we thought a few years ago: It is very compact, formed by gas and dusty clouds orbiting the black hole, and its properties depend on the AGN luminosity and accretion rate. Moreover, it is not an isolated structure, but appears connected with the galaxy via outflows and inflows of gas, like streams of material flowing as part of a cycle. 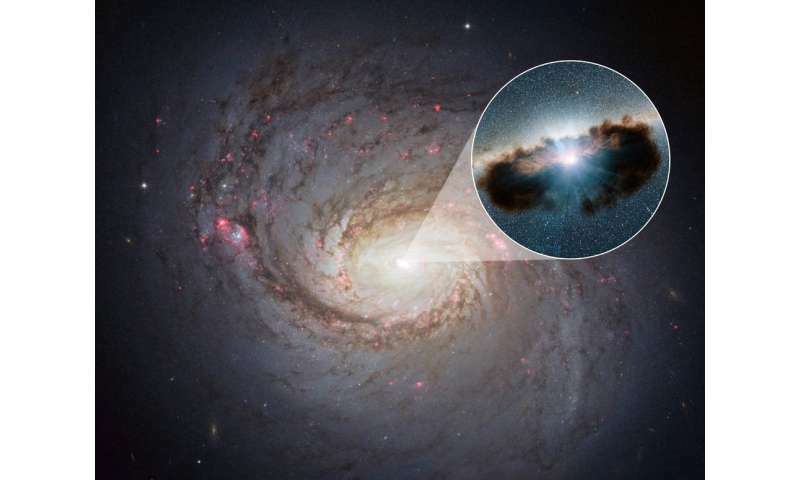 This gas flow cycle keeps feeding the black hole and regulates the formation of new stars in the galaxy." Recently, the Atacama Large Millimeter/submillimeter Array (ALMA) has imaged the nuclear obscuring material in an active galaxy for the first time. ALMA operates in the millimiter and sub-millimeter range, and the latter traces the coolest dust and gas surrounding AGN. In the case of the galaxy NGC 1068, ALMA has shown that this material is distributed in a very compact disc-like shape of seven to10 parsecs (pc) in diameter, and in addition to the regular rotation of the disk, there are non-circular motions that correspond to high-velocity gas outflowing from the galaxy nucleus. "Over the next decade, the new generation of infrared and X-ray facilities will contribute greatly to our understanding of the structure and physical properties of the nuclear material," concludes Claudio Ricci. Moreover, it is not an isolated structure, but appears connected with the galaxy via outflows and inflows of gas, like streams of material flowing as part of a cycle. If these plasma ignoramuses "vision" weren't clouded by the dust and "gas" it would be obvious to them that these electric currents they are observing would be expected. But alas, they are of course plasma ignoramuses and even the most fundamental aspects of plasma dynamics are lost on them. Pathetic! We now know that this nuclear material is more complex and dynamic than we thought a few years ago: It is very compact, formed by gas and dusty clouds orbiting the black hole, and its properties depend on the AGN luminosity and accretion rate. Very compact since the major source is the massive core star itself! And the properties do indeed depend on the AGN luminosity; generally, the greater the mass, the greater the luminosity, and the more active is the AGN in producing new matter therein and expelling it into the surrounding compact region. However, the active state ejecting matter therefrom grows increasing in frequency with the internal growth of the core star. So, astronomers, confirm this prediction through observation: that the surrounding gas rich region grows larger with the luminosity of the core, and that the active state grows more frequent with the growth of the core star. Eventually, the core becomes so active that it blows the surrounding gas clear. And the core may remain predominately in the active state, dissipating the galaxy eventually as the stars migrate radially outward. Then the AGN is not clouded in mystery, but shines across the visible universe for us to marvel. Moreover, it is not an isolated structure, but appears connected with the galaxy via outflows and inflows of gas, like streams of material flowing as part of a cycle. This gas flow cycle keeps feeding the black hole and regulates the formation of new stars in the galaxy. Don't be fooled. This is simply a convenient assumption by the committed merger maniac community. AGN activity is more likely regulated mostly be internal dynamics, rather than external flows that originate from within the core anyway. "We now know that ..."
I see this all the time, when in actual fact they do not know. Black Holes are still just a theory if you do the research, and any claims of processes or structures based on the existence of such theorised objects are also just theories. Fake science. Well, there's something going on there, and it ain't electrical. Of course there is electricity involved, search for "magnetar huge electric currents" for example. If you have huge electric currents there must be huge potential differences. What's not electrical about that? That we should understand the "value" of the article we must look at geometric proportions. 2. The central diameter of the galaxy is 40,000 ly equator, pole to the other one, 30,000 ly (http://www.astrod...y.html). " 4. Why this "excellent technique of looking" through thick matter 20.000ly not applied to Saturn, Jupiter ...?